The popular Allen & Heath GL Series has grown with the addition of the GL2800M, a dedicated monitor console offering an easy to use, innovative tool set for simultaneously mixing large numbers of wedges and in-ears. With the benefits of personal freedom, a tailored mix for each musician and a quiet stage, IEM monitor systems have become increasingly popular with performers and engineer's alike. Although IEM has become a lot more affordable, the console required to run them properly is typically too large, complex or expensive for all but the biggest budgets. Stereo gives the performer a more natural listening environment but can be impractical for many sound providers as it doubles the number of mixes needed, often exceeding the capability of the console available. The GL2800M packs in a massive 16 mixes letting you control up to 8 stereo in-ears or more as combinations of wedges and in-ears. Multiple stereo in-ear mixing presents new challenges to the monitor engineer. You need to balance every source including ambience within the stereo image according to the preference of each performer. The GL2800M provides tamperproof global mono/stereo assignment of its 16 mixes. Each stereo mix has level and pan control as well as stereo AFL signal checking for quick mixing without compromise. Standard console headphones monitoring is simply not enough. The engineer should be able to listen to a wedge mix exactly as the performer hears it. This takes a similar speaker placed next to the console, with similar fader control and output drive. An IEM mix should ideally be listened to using a wired or wireless in-ear system similar to that worn by the performer. Unique at its price point, the GL2800M offers both types of engineer's monitoring with the ability to configure combinations of mixes to either the wedge or IEM monitor as appropriate. You can even configure a 'follow IEM' mode so that the built-in headphones amp can be used as a poor man's IEM monitoring feed. Simply plug your in-ears into the alternative 3.5mm headphones jack provided. Allen & Heath looked at the many issues unique to the monitor engineer and they crafted a feature set that will make the job a lot easier... the built-in oscillator/pink noise generator for testing and calibrating the system, independent talkback to each performer and FOH, reverse talkback for the house guy to talk directly to the engineer's monitor, swept HPF on each mix to cut unwanted low end and improve amplifier efficiency, mix polarity and EQ to clean up the overall stage sound, dim function to quickly catch problem feedback, 4 mute groups, PFL automatically override AFL for quick source checking, and a lot more. With space at the side-of-stage mix position and in the truck transporting equipment between shows at a premium, the small foot print and compact flight case outline of the GL2800M will be appreciated. The 16 mix GL2800M 32 channel frame is less than 1.2m (47") wide, the same physical outline as the 10 aux GL2800, and light enough to be an easy two person lift. With built-in XLR mic splitter you also save the cost, space and handling of another rack of connections. 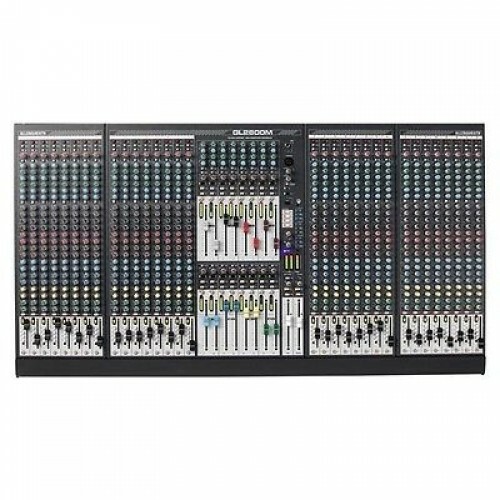 Mix1-8 include 2-band swept frequency output EQ convenient for tailoring the response of in-ears or for feedback control where rack space or equipment budget is tight.